Krishna Puskar Holidays from 8th Aug 2016 to 23th Aug 2016 they working the Schools from Sep 30th to Oct 8th 2016 and expect 2nd October 2016. RC. Spl/DEO/2016 Dt. 08-09-2016. 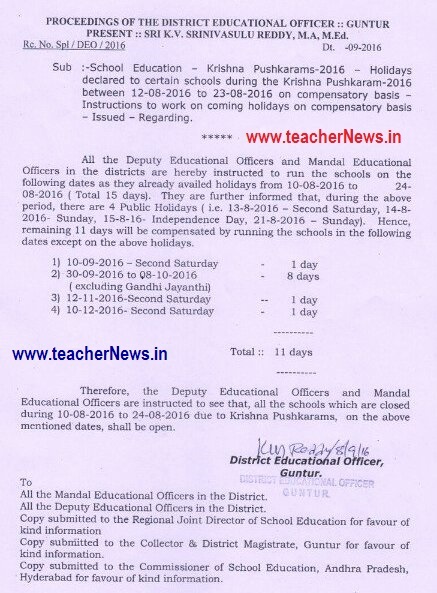 Download Krishna Puskar Holidays Schools working Dates Copy, Education Krishna Pushkarams-2016 Holidays declared to certain schools during the Krishna Pushkaram-2016 between 12-08-2016 to 23-08-2016 on compensatory basis Instructions to work on coming holidays on compensatory basis issued Regarding. All the Deputy Educational Officers and Mandal Educational Officers in the districts are hereby instructed to run the schools on the following dates as they already availed holidays from 10-08-2016 to 24-08-2016 (Total 15 days) They are further informed that. during the above period, there are 4 Public Holidays ( i.e. 13-8-2016 Second Saturday. 14.8.2016 Sunday, 15-8-16 Independence Day, 21-82016 Sunday). Hence, remaining 11 days will be compensated by running the schools in the following dates except on the above holidays. 'Therefore the Deputy Educational Officers and Mandal Educational officers are instructed to see that, all the schools which are closed during 10-08-2016 to 24-08-2016 due to Krishna Pushkararna, on the above mentioned dates, shall be open.